I am starting to feel better, at least until I look around and see how much housework I have to catch up with. 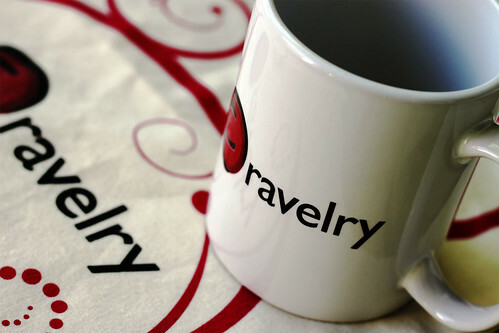 I ordered a Ravelry mug and drawstring bag. I really wanted the mug, but the postage was a little expensive so I added the bag to the order to even things out. I use too many zip-lock bags anyway, so having a reusable cloth bag is a good choice for me. Right now the mug is in the dishwasher. Tomorrow I will post about why I wanted it. Today I will just mention how much I love having photoshop. This photo is still monotone, but with curves in photoshop the blue in the cup gets deeper, and so do the yellow tones in the bottom right corner. The photo just pops more. I know photoshop is an expensive program. Rick is an artist and we hope to be able to eventually sell prints of his work. Photoshop is used to change a photo file into one that printers can use. We still have lots to learn in that area though. So for now I can use it to enhance these blog photos which is really fun. This entry was posted on Saturday, May 23rd, 2009 at 3:00 am and is filed under Photography. Tagged: Knitting, Photo. You can feed this entry. You can leave a response, or trackback from your own site. Your photos are always works of art! can never have too many coffee mugs IMHO.